So I did say that I was going to do a diet post round about now. And I really was. But sometimes you have a long day at work and what seemed like an exciting meal when you were meal planning on Sunday evening is more than a tad dull on Wednesday. Plus I’m a BIG believer in treats. Probably too many treats, but I’ll save that panicking for 3 days before my holiday. We went for the Lamb Tacos, Beef Quesadilla, Jalapeño Poppers, Chicken Tlacoyos and Pinche Gucamole which came to £23. The lamb taco’s were 3 palm sized tortilla filled with delicious slow cooked smoky lamb (if you’re sharing, be prepared to fight over the third). The beef quesadilla were again deliciously smoky and filled to the brim with meat and melted cheese. The jalapeño poppers were cooked perfectly, deep fried (without being greasy) bread crumbed jalapeños stuffed full of cream cheese (watch out for cheese dribbling down your chin syndrome). I’ve never had tlacoyos before so we opted for those, they are thick maize flat breads topped with refried beans, cheese, salad, sour cream, and in this instance shredded chicken. The chicken was the perfect spice to complement the fresh toppings and stodgy flat bread. 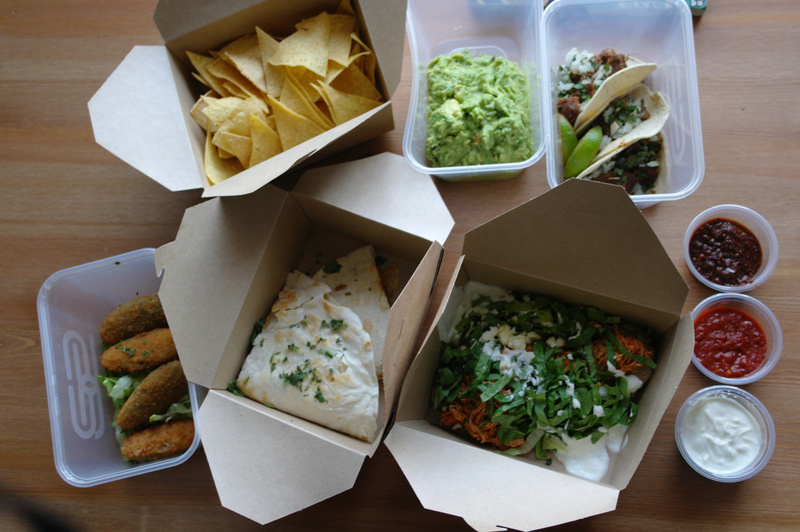 All of these came with a choice of salsa’s, we picked an arbol salsa which was spicy with a huge chilli kick at the end, and what I think was their salsa ranchera, smoky chipotle based-both delicious. I’ve saved the best till last, my absolute favourite from Pinche Pinche is the simple guacamole and chips. SUCH good value (there must be about 4 avocados in the serving of guc you get), freshly made with added tomato and zingy lime juice. My absolute must when I order from them. I was stuffed after sharing everything with P but didn’t feel dirty and at just over a tenner each, great value for decent, quality food. It’s a bit of a pain having to pick up (but I guess it is predominately a restaurant) however it did only take about 20/25 mins. Plus it’s WELL worth it.